Amidst the chaos comes a young knight: Arnau of Vallbona. After his Lord is killed in an act of treachery, Arnau pledges to look after his daughter, whose life is now at risk. 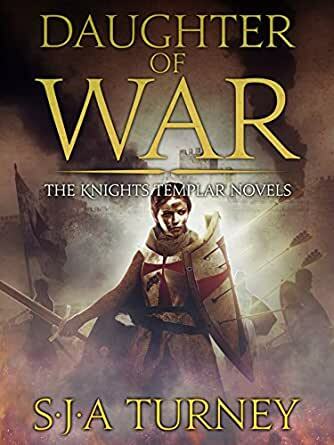 But in protecting her Arnau will face terrible challenges, and enter a world of Templars, steely knights and visceral combat he could never have imagined. Maybe the best novel that Turney has written. Wonderful pace and also great detail about life in this new period for him. Turney made his name with Roman fiction, here he moves to Spain in the time of the reconquest. I am amazed by his knowledge about the period and the place. It reads as if he has been a student of Spain then and the Templars all his life. It is the detail that makes this book so rich. But this is not a history book but a work of adventure written with the flair for character, good and evil, and energy. I read it in one long sitting and could not put it down. The Templars in Spain. What a great change. Something new and well done. The story brings to life the Templars, not in Jerusalem, but Spain, during the time when the Moors were retreating. We get to see inside the mysterious working of one of the most famous warrior/spiritual groups in history. We get to meet a new hero, who is human, but learning to attain some skill and motivation. We meet some interesting characters, good and evil, strong and weak. I felt badly when one of the characters I was beginning to like was killed off. Not a problem, others began to fill his shoes. The tale itself moves quickly to a stunning climax. Much of the information is based on historical facts and known locations. The hero and villian are not real, so they get to do some fun things. I am used to reading Turney's well researched novels about Rome, so this is a treat. I want to compare the hero in this story to his Marius in the Marius Mules books. But I need more. 3 mensen vonden dit nuttig. The Reconquista is a period I’ve never studied in detail(being buried in Rome, England and Egypt) but I have read some about it and this book brought it home in a realistic manner. Templars are mostly known as Crusaders, but there was a lot more to them. Their downfall was kind of the beginning of the end for the primacy of the Pope in civil affairs. In every time there are lots of humans more ready to do evil than good, especially in return for lots of money. Lots of kings were that way; plenty of other politicians, too. Have to admit the author’s sense of humor gets me- I’m a cynical & satirical person by nature- but if he had made up the name Titborga I think he would’ve been in trouble! Een iemand vond dit nuttig.